Fast-friends AWAKE are just about to make a leap into the world of major bands in their own new adventure. Let’s see what their thoughts are on their first steps towards the future and just how much of their hearts they included in their final Indies Single ‘adventure 0’! How did you come to start AWAKE? 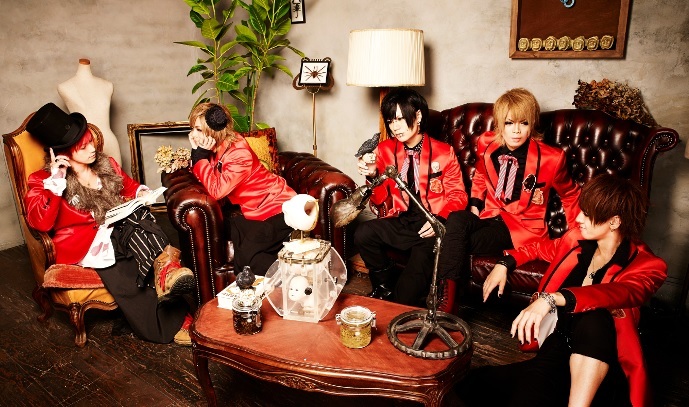 Yukio: We had all done session bands together and were really good friends before we decided to make AWAKE. At first, it was me, Yuuki, Naoto, and eventually Eru that decided to form a band. Eru: We’d all been in different bands that began to split up and move on. We had already been really good friends for nearly two years so we thought that it would be amazing if we could get together and make music. That friendship is important to us. Yahiro: I joined them about two years after their formation when their previous bassist unfortunately left. I played support for them for a while and eventually they invited me to stay with them as permanent member. Yuuki: I’ve always loved Harajuku’s image and that’s what I imagine most of the time I’m making AWAKE’s songs. I think it’s plain simple fun. Naoto: We’re Gira-Gira Kei. Kira-Kira went through a stage a few years back where it spread really rapidly and we took the idea of Kira-Kira and made it our own. Yuuki: It became something burning, and that something burns brightly. Naoto: Our music is fairly varied though. We thought that if new genres appeared then Visual Kei would be able to spread as a genre and not die out. Eru: To me, our concept is ‘Non-fiction’. This is not a made-up story, and we don’t force our emotions. What you see is real, our own story. What kind of themes often appear in AWAKE’s songs and where do you draw inspiration from? Yuuki: Usually our themes are just what we are feeling at the time or what we want to convey in that moment. We usually just make what we want to make and don’t particularly stick to any one theme. We’re kind of our own biggest fans so sometimes we just make what we think a fan would enjoy –laughs- We also really love songs aimed at making lives fun for all the people watching us. But, whatever we decide to do, we make sure that it is very much of AWAKE’s essence. We do what we can do, and we do what we want to do at the time. I take a lot of inspiration from Harajuku but also from imagining what it would be like to play the song I’m working on at a major venue like Tokyo Dome. What song would you want people to listen to out of AWAKE’s repertoire? Yukio: This is really difficult! –laughs- I would say ‘all of them’ too, but if I had to choose I would go for our new song ‘Story 0 ‘ on our last Indies Single ‘adventure 0 ‘. Yahiro: All of them? Or… well actually I really like the song ‘Bye x Bye’. I may have, kind of, cried a little when we’ve performed it before. Yahiro: But it’s a good song…!! Naoto: Such a fan~ I would say that I would like everyone to listen to Gyara-Gyara Communication. We made this song at the time of our formation and for me, when I listen to it, it makes me think ‘yes. This is AWAKE’. I also think that even if someone who doesn’t know us were to listen to this song, they’d get an inkling of what we are about and feel really involved in our music. Every time you stand on stage, what performance do you want to give? What kind of emotion do you try to convey? Naoto: A hot live, passionate. One that gets everyone moving. In my heart, it’s that energy and that vibrancy that is the core of AWAKE. Naoto: Just do what is natural. Yukio: Yeah, it really depends on the day and how I’m feeling. At a live, I don’t have to worry aimlessly about the future, so I just lose myself in the moment and do. Yahiro: Me too. I just do whatever feels right. At a live, you can forget all the bad things in life and all the suffering or stress you’re going through and just enjoy the music. Yuuki: I think we all just perform how we want to every time, but we make sure that it’s the best experience possible and that everyone is happy. Our songs are a way of living and an expression of ourselves. We want to make it passionate, and show how we really feel. They’re our own story, and they help us to progress on to the future. ‘I want to live’. And that is the message every single song of ours says. Eru: There is no thinking, it’s all in the moment. It’s from the heart with no lies. When I sing, I’m giving you a little piece of my heart. On 16th September, your last Indies Single ‘adventure 0′ was released. It’s your final Indies single, so it must be precious to you all. What does this single mean to you? When you listen to it, what kind of scene do you imagine? Naoto: ‘Story 0′ has the meaning of ‘let’s begin’. Lots and lots of different things happen in life, and things change for better or worse, but we just wanted to reassure everyone that we are going to keep on trying our hardest as AWAKE. We’re gonna burn bright, and we wanted to convey all our passion as a message in this single. From here on, our life begins. As for the themes we included in this single, other than our passion, we just wanted to tell people to achieve their dreams, to go for it. Recently there have been a lot of bands splitting up and we want to reassure people that we want to avoid that. We put our hearts into this song. Yukio: If you have a goal, something that you desperately want to achieve, you keep on plowing forwards towards it, but, inevitably there will come a time when you will hit a wall. Maybe several walls. When you hit them, you have to pause for a moment and sometimes you can’t continue. You have to wait and think ‘how can I overcome this?’ And when you reach a wall, it is very difficult to do anything by yourself. When I think about this song, it gives a way of recovery, and I can pick myself up and continue moving forward. And who wrote the melody? Yuuki: I did. I write all of AWAKE’s songs. Then Eru usually puts the lyrics to them. So, speaking honestly, what are you feeling about this move to being major? Naoto: Oh, I’m really excited. I can’t wait to make music! Yukio: I’m really looking forward to it. It’ll be fun! But… I really can’t imagine it right now. A major move is something that is there but not really touched in Visual Kei. I really want to start it quickly! Yahiro: We will keep on walking and we will play Tokyo Dome. Yuuki: We want to play Tokyo Dome. We want to try hard and travel the world, so we will try our best to achieve that. all. Even if you don’t particularly like our music, at least know that we are there for you. Yuuki: Our last single is only really available in Tokyo, Nagoya and Osaka stores, as well as being sold at our goods tables at lives, but if you can somehow get hold of it and listen to it for us, we would be really happy. We’d like to spread further afield. We also have our ‘Best of’ Album, and you can hear some of the songs on YouTube. You probably won’t like all of them, and that’s understandable, but we would be really, really happy if you could come to like some even a little bit. Thank-you. I can see that it has been quite an eventful time for you. Let’s take some time out and talk a little about yourselves. Yukio: I’ve become interested in quite a lot recently, but I’d have to say that I really like Belgian beer. I drink it a lot and have a ton of recommendations. It’s really, really delicious. Usually foreign alcohol is. I would recommend that you go and try some! Yahiro: I really don’t know… probably…wearing hats. -laughter- -English- hats. Yuuki: That was way before! Ah… I don’t know… I guess it’s not recent but… Naoto. I’ve also been into running for about a year. If it isn’t raining I’ll always go out for a few hours because I really love that feeling you get when you go running. Yukio: -instantly- If it was taken from me I would die. Yukio: That would be it. The end. No more. Naoto: -laughs- Everything would be pointless. Yukio: Music is like water. I need it to survive. Yahiro: Music is my body, my blood. It’s me. Yuuki: It consumes me, in the best possible way. It’s always been there for me since I was at a young age. Naoto: It’s something that I won’t ever get bored of. Something I can’t get bored of. Eru: It is all that it is now. I want to keep going on in this way without music wilting or dying within me. If I can live like that… then I am content. What has been a very important memory for you since you joined AWAKE? Yukio: Every single live is important to me. Naoto: It would have to be the live at Alta-mae where we announced our major debut. That was unforgettable. Eru: All my memories with AWAKE are important to me, and there are too many too choose from… I probably can’t recall even half of them. But actually, some of my most important memories are when we all rally together to help each other out if we’re troubled. There was a time when it snowed so much, I couldn’t get to Osaka but everyone helped me to figure out a way. Oh! And every time we get together and celebrate a birthday! That always remains with me! We always throw great parties! Yuuki: Oh, there are so many good memories. Before our formation, we used to go to Harajuku every day and just hang out, eat, see the sights. For me, other than lives, just spending every day with the members hanging out is a wonderful memory for me. Wherever, whenever. I just really enjoy spending time with them. From now on, I want to live more and experience more with them. If you became another member for a day, who would you be and why? Naoto: I’d be Eru because he is really amazing. I can’t explain it well enough, but he’s just amazing. Yuuki: I really don’t want to be anyone else! –laughs- if it were 2 weeks, I could fix some of their flaws, but that’s impossible to do in just one day! –laughs- I’d have to like… make them learn more formal Japanese or something… I don’t know… I guess if I had to choose, I’d choose Eru too. Yuuki: One day is impossible, right?! Yukio: If we were abroad for a live, and I would definitely just want to me myself. I want that experience to be mine. Eru: I’d be Yahiro. He’s pretty cool, and elite. He was the only one of us who was a university student. Oh. And he’s cute! Yuuki: I want to go anywhere in Europe. I would travel all over, but I’d particularly like to go to Germany. It has a really new atmosphere to it. I’ve only seen it in textbooks and in photos though, so I want to experience that for myself. Yukio: I’d totally go to America for the food. I want to buy everything. And I want to go to a proper American steak house and eat steak because they’re so huge. Yukio: The portions are huge! I want to see that! And eat it! Yahiro: I want to go to South America. I want to see the Bolivian salt lakes! Yuuki: I also want to go anywhere with an ocean. I love seeing the sea. Naoto: I want to go to London! It so fashionable and the buildings are really beautiful. Eru: I want to go everywhere. I want to travel the world. Brazil, America, France, Canada… I want to see it all. My parents actually really love Canada and have been there a lot, so I’m really interested in going there myself. I’ve been abroad a few times, but I usually stay in Japan, and when I do go abroad it’s with my family and not the band. I really want to see the world with these guys. I’d like to see the whole of America. Especially Las Vegas and Times Square in New York. I also love places that have a lot of nature, like Australia. Finally, do you have a message for all your foreign fans? Yukio: If you get the chance, please come and meet us! We’ll be waiting and we’ll give you a huge welcome! Yahiro: Even though we’re so far apart, music is something you can hear and listen to in any country. If you can, please try and listen to our music! Yuuki: I think that AWAKE is a very rare band. We’re kinda different from a lot of bands. If you can come and see us at least once and listen to some of our songs live, you’ll really be able to see what we’re about… I think that’s a good thing. Naoto: I know that there is usually a language barrier between us, but I think that if we work together, we can smash that wall and just have a fun concert together! If you a can, please come to Japan, eat curry and see AWAKE! Eru: I really want to come and meet you, so please wait for me~! We have a lot of foreign fans, I think, especially in places like Australia and England. When we see them here in Japan, we’re always so happy, and it’s so lonely when they have to return home… please come and see us again!